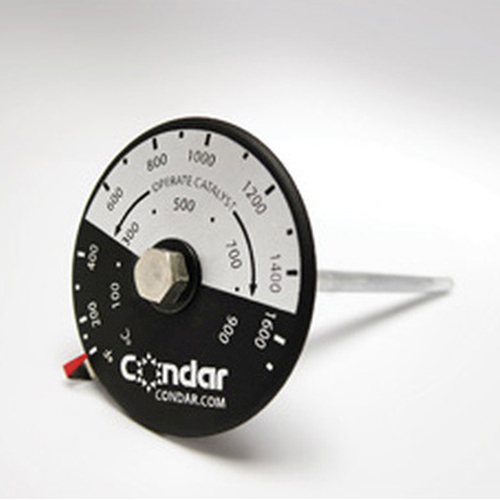 These thermometers are made specifically to accurately measure flue gas temperatures immediately behind a combustor. They register accurate readings up to 2000° Fahrenheit, and can be retrofitted to most catalytic stoves to comply with EPA monitoring regulations. Please check with your stove manufacturer when retrofitting for correct hole placement. An indispensable tool for efficient wood stove operation, these thermometers signal when to switch off bypass, and when to reduce fire to prevent degrading expensive combustors. It also indicates declining performance of a failing catalyst and the need for replacement. The probes on these thermometers are manufactured of copper for fast heat transmission, then plated for corrosion resistance. The probe end may be placed up to a half-inch away from the combustor, but should not touch it. Offered in various lengths to fit all brands, with black dials in small (1½-inch) or standard (2-inch) diameters. Consult the instructions provided by your stove manufacturer before installing.